Abstract: Wind engineering is best defined as the rational treatment of interactions between wind in the atmospheric boundary layer and man and his works on the surface of Earth. This presentation will describe an overview of recent study activities in this field and will discuss a series of research challenges in the aeroelasticity of slender systems. Slender systems are usually large-period and low-damping structural systems, sensitive to vibration, fluid-structure interaction and susceptible to damage induced by destructive winds (e.g., hurricanes). Nevertheless, if appropriately designed, slender systems may also be used to harness the valuable wind resource. Activities have been dedicated to the derivation of methodologies for predicting the aeroelastic analysis of slender systems by taking into consideration modeling and experimental measurement “errors”. These “errors” are unavoidable since the loading is often evaluated experimentally by wind tunnel tests. Even though modern experimental techniques have attained adequate levels of sophistication and (statistical) confidence, loading uncertainty analysis is still relevant, especially for the interpretation of discrepancies, sometimes observed, between full-system vibration and numerical predictions. The investigated methods are both analytical (stochastic calculus) and numerical (Monte Carlo). Examples will include aeroelastic vibration of long-span bridges and wind-related interactions on the envelope of a tall building. Remarks will be used to formulate a “paradigm shift”, from avoiding dangerous winds to exploiting the wind resource to the engineer’s advantage. The same aeroelasticity principles can in fact promote the use of “flutter-mills” as a potential promising alternative to other wind energy systems. Bio-sketch: Luca Caracoglia is an Associate Professor in the Department of Civil and Environmental Engineering of Northeastern University, Boston, Massachusetts, USA. He joined Northeastern University in 2005. Prior to this appointment, he was a post-doctoral fellow in the Department of Civil Engineering at Johns Hopkins University, Baltimore, Maryland (USA) in 2001-2002 and a post-doctoral research associate in the Department of Civil and Environmental Engineering at the University of Illinois (Urbana-Champaign, USA) in 2002-2004. He received his Ph.D. in Structural Engineering from the University of Trieste, Italy in 2001. His interests are in structural dynamics, random vibration, wind engineering, fluid-structure interaction of civil engineering structures, nonlinear cable network dynamics, energy harvesting systems in wind energy. 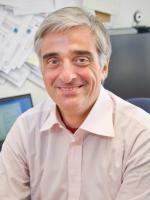 Luca Caracoglia received the NSF-CAREER Award in 2009.